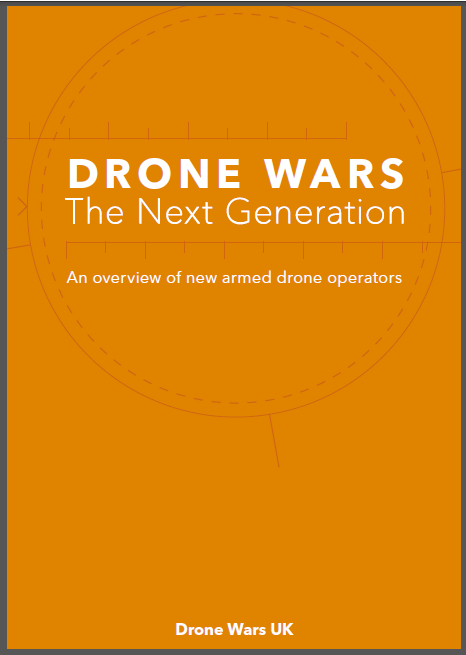 Drone Wars UK regularly publishes briefings on key aspects of the growing use of drones. Our publications can be downloaded here. The UK has used armed drones to undertake airstrikes since 2004, either in conjunction with the US or utilizing its own fleet of armed Reapers acquired in 2007. 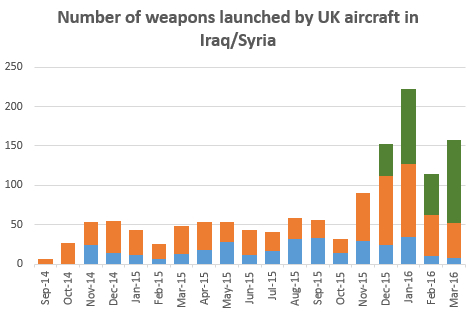 And increasingly it seems the UK is relying on its Reaper drones to undertake airstrikes, with Ministry of Defence figures showing the percentage of British airstrikes in Afghanistan undertaken by drones rising from 52% in 2009/10 to 82% in 2013/14. Diminishes international security by normalising the basing of armed drones overseas, sending a signal to other countries that it is acceptable to do so. Rather than ‘jumping from the frying pan into the fire’ with its armed drones, the UK should instead pause the programme at the end of combat operations in Afghanistan to allow a thorough evaluation of the actual impact of these systems on the ground in Afghanistan. At the same time the UK, as one of only three users so far of armed drone technology, should investigate along with international partners and civil society the long-term implications of their use on both UK and global peace and security. Statewatch and Drone Wars UK co-published a report into the use of unmanned drones in UK airspace. Back from the Battlefield: Domestic Drones in the UK written by Chris Jones of Statewatch examines the current use of drones in UK airspace by public and private bodies looking in particular at their use by police and border control authorities. The report argues that it is essential for widespread debate, discussion and democratic decision-making on the issue of ‘domestic’ drones in order to establish acceptable limits on their deployment and use by public authorities, private companies and individuals. The first section of the report examines the regulations and law governing the use of drones. The CAA currently tightly regulates the use of drones in the UK due to safety concerns. While this frustrates many would-be drone entrepreneurs, a number of crashes by small drones at public events over the past year has led to death and injuries and show that strict regulation is absolutely necessary. The report also addresses the other major concern with regard to the use of drones in civil airspace: privacy. The government has argued that the Regulation of Investigatory Powers Act 2000 and a recently adopted Surveillance Camera Code of Practice have to be taken into account should public authorities wish to operate drones. However, both contain numerous shortcomings and neither applies to private companies or individuals. The report also looks in some detail at the use of drones by police and border agencies and suggests that the UK National Crime Agency (NCA) may already be using surveillance drones. 12 of Britain’s 51 regional police forces are known to have used drones to some extent over the last five years. Finally the report reveals that at least £80 million of public funding from both UK and EU institutions has gone towards the development of drones or the technology and facilities seen as a prerequisite for their use. While the developments in the use of civil drones is being backed by numerous public and private interests, there appears to have been relatively little – if any – thought given to the issues raised by the potential widespread introduction of domestic drones. It is essential that a widespread debate on these issues takes place now, before it is too late. 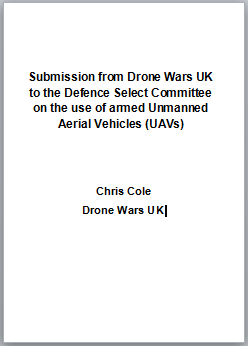 In April 2012 Drone Wars UK made a submission to the Defence Select Committee Inquiry into the use of Remotely Piloted Air Systems (RPAS). In the submission we detail five particular legal and ethical concerns relating to current use of armed UAVs and two specific concerns about future developments. Concerns about current use include whether armed UAVs are lowering the political costs of military intervention, expanding the use of targeted killing and creating international instability rather than security. With regard to future use we detail concerns about moves to develop autonomous unmanned systems as well as arming smaller surveillance UAVs. As well as making some specific recommendations in relation to these concerns, we make a plea for greater transparency in relation to the use of armed UAVs by UK armed forces. Arising out of its five years of armed UAVs operations, the UK has a great deal of pertinent information and data that could go a long way to answering some of the serious ethical and legal questions surrounding their use. As one of only three countries that have used armed UAVs in combat, we believe the UK has a specific responsibility to address these concerns and to take the lead in helping the international community grapple with the rise in use of armed unmanned systems before they proliferate further. In September 2012 Drone Wars UK published a report showing that the UK Government had spent over £2 billion purchasing, developing and researching drones and unmanned systems since 2007. The report, Shelling Out: UK Government Spending on Unmanned drones, finds that the UK has spent £872m on five different drones that are currently in service with British forces, including £506m on the armed MQ-9 Reaper drone. The UK has committed a further £1,031m to developing new drones such as the Watchkeeper UAV and BAE Systems Taranis drone. Finally the UK has funded £120m of research within UK universities and British defence companies looking at unmanned systems. This included £30m funding for the ASTRAEA programme to open up UK civil airspace to autonomous drones. In addition to the £2bn already spent, in 2013 the UK is likely to begin committing funds to the Scavenger programme to develop a new armed medium altitude, long endurance (MALE) drone. The UK MoD estimates the Scavenger programme will cost £2bn over its lifetime. 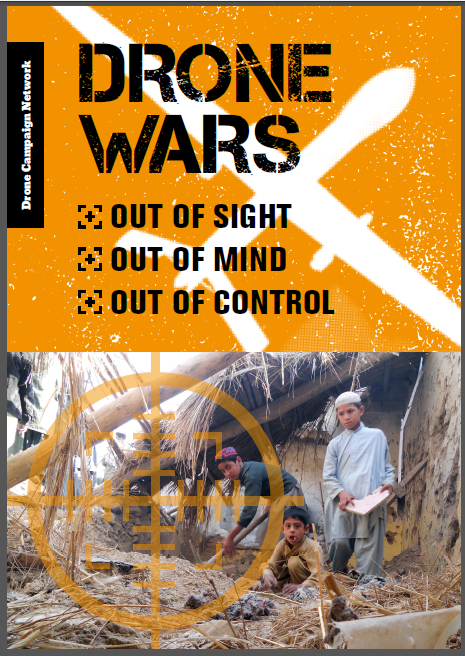 The 2012 Drone Wars Briefing explores some of the key issues arising from the growing use of armed unmanned drones in a detailed, yet, accessible way. Examining UK and US military drone operations, as well as looking at future developments and legal issues, the fully-referenced briefing will be of use to both those new to the issue as well as those with a long-term interest. Each of the briefings five key sections starts with a short background summary before reviewing what has happened over the past year. In addition, the 36-page document looks at the growing autonomy of drones; Israel and drones and the push towards allowing drones to fly within UK civil airspace. The briefing concludes with a short essay arguing that at the very least there must be proper public accountability for the use of armed drones and an informed public debate on their future development and use.